Raise armies of skeletons to defend your base, or go to war with other players! 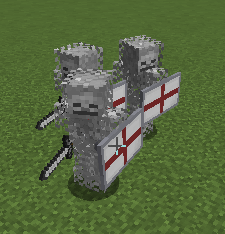 Multiple AI modes for your skeletons' attacks and movement, which you can configure per-skeleton or army-wide. Possibly a fun easter egg or two. 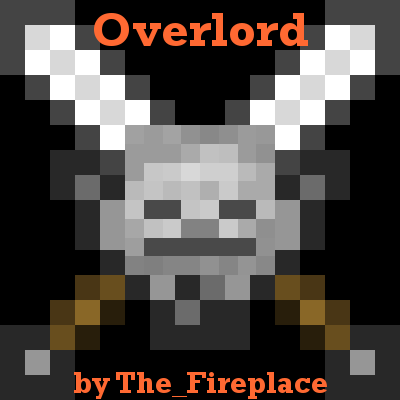 Check out my official Overlord addon, Mechanical Soldiers. Adds a manual in-game! Just install Guide API. The very first thing you'll want to do is craft either the Overlord's Stamp(these are cheap, and one-time use) or the Overlord's Seal(more expensive, but unlimited uses, and can control whole army's AI). Next, if they don't already have the glowy enchanted effect, you will need to hold the Seal/Stamps and right click with it to claim it/them as yours. The weakest skeleton type. Only has 8 health, is able to equip armor and a weapon, can only use melee attacks. A mid-level skeleton. Has 20 health, can equip armor and weapons, is able to use a bow, has a 9 slot inventory, and is able to equip Augments. The most powerful skeleton in the base mod. Health starts at 16, and increases with level. Can equip armor and weapons, can use a bow, has a 9 slot inventory, is able to equip Augments, and most importantly, can level up, which increases health, speed, attack power, and step volume. Start off by making a Baby Skeleton Maker. 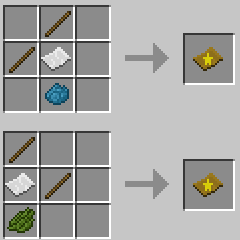 This is an old recipe, it will not work in newer Overlord versions. 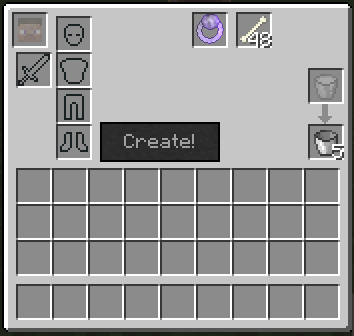 Start off by making the Skeleton Warrior Maker. 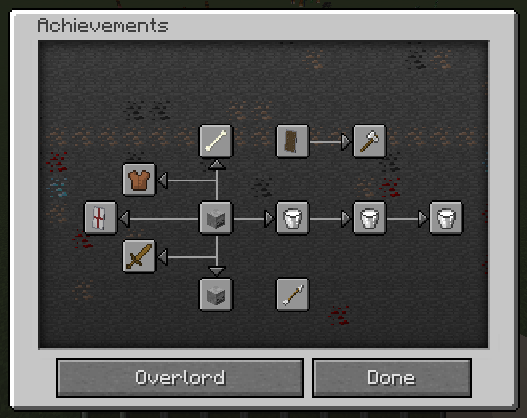 Note: This is the same process as curing a Zombie Villager, but done on a Skeleton. 1.) Make sure it has the weakness potion effect. The converted Skeleton will be much like a Skeleton Warrior, except it cannot gain experience and level up. To make your Skeleton Warrior more powerful, you have two options. First, right click it to open the Skeleton Warrior GUI. Then, put Milk Buckets or Bottles in its inventory, and it will drink them. The higher its level gets, the more milk it will take to level it up. Your Skeleton Warrior will draw in XP from defeated mobs, and can gain levels that way. If your Skeleton has been hurt in combat, don't worry, it can be healed. Just shift+right click it while holding a Milk Bucket, or throw a Milk Bottle at it. Alternatively, you can level it up, and it will fully heal then. Another method of healing, for Skeleton Warriors, is to give them an item that grants a Regen augment. Stationed - Your warrior will not move or melee attack. Follower - Your warrior will follow you around, much like a pet Wolf does. Aggressive - Your warrior will attack every potential threat. 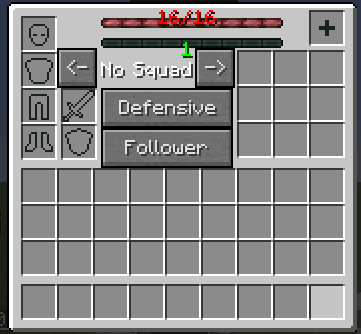 Non-allied players, mobs, and anything that attacks it, and anything you attack. 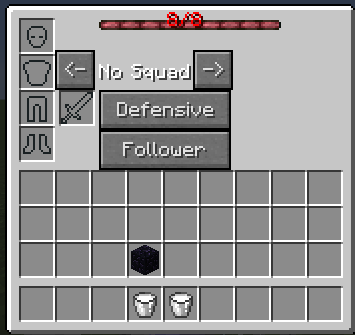 Defensive - Your warrior will fight off mobs and anything that attacks it or you. Passive - Your warrior goes full pacifist and won't attack anything, even if it is attacked. Want your Skeleton Warrior to look more like a player? How about preventing it from burning in sunlight? Make a skinsuit for it, and you can accomplish both. To create a skinsuit, it takes a full set of leather armor, 2 rotten flesh, a red dye, green dye(cactus green), and blue dye(lapis lazuli). The shape doesn't matter. If you want it to be any skin other than Steve, you need to then put the item in an Anvil and name it the player name you want the skin from. It is case sensitive. To apply the skinsuit to a Skeleton Warrior, Shift+Right Click it while holding the Skinsuit. To remove a skinsuit from a Skeleton Warrior, Shift+Right Click it while holding Shears. Augments are items that give your units special bonuses. Baby Skeletons cannot have augments. Anvil - Makes the unit fall quickly, and injure anything it lands on. Also grants Resistance. Cake - It's Party Time! Units launch fireworks on level up. Btw, the cake was a lie. Cool mod for creation of army, but enought tinkerers construct integration. They attack each other? As in, your own skeletons attack each other? That's strange, I'll look into it. 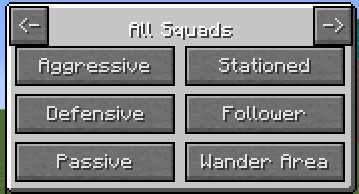 Can this/will this work with either Clans, or the vanilla teams system? Clans has partial support for this, in that it protects your skeletons from non-raiding player attackers, as long as your skeletons are on your land. If you'd like to see additional support of some kind, post exactly what you're looking for on the issue tracker and I'll see what I can do. Love this mod, but I'd like to suggest that it would be cool if you can make the skeletons go to work! Like some mine, some farm, etc. I'd be an amazing feature! That's a feature that has been requested for a while. I'm thinking about doing an overhaul of skeleton behaviors when I update to 1.13.2, so I may see if I can throw in something like that. I have a little problem. 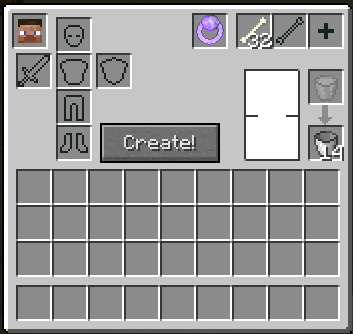 After version 2.4.6 the skeleton makers don't accept any milk container (even the vanilla bucket and the mod's bottle) can you check the problem? I'll look into it when I get the chance. First of all, I like your mod. Secondly, there is an issue. If you make them stationery holding a sword when the mode is set to aggressive, they will not rush to attack and return to their place. Currently, when standing still and set to aggressive, skeletons are intended to just fire their bows. 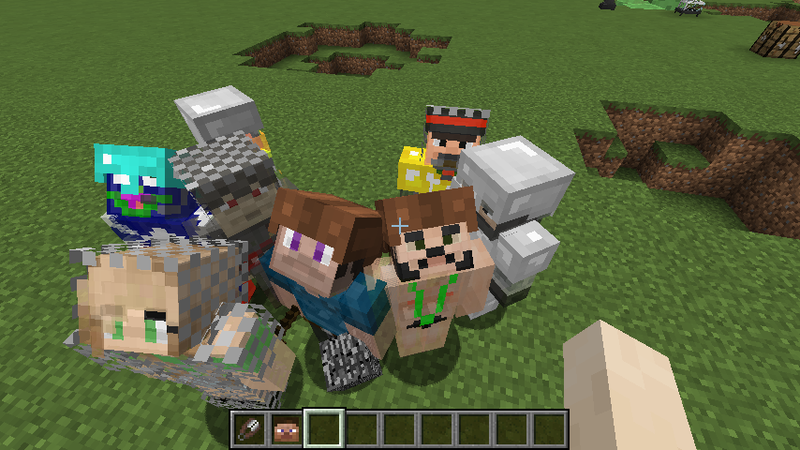 I may try to overhaul their behaviors when I update to 1.13.2 to make the system better all around. Hey mod creator, can I ask? is it a bug or a feature that my milk bucket gets consumed by creating adult skeletons? because if I am in creative mode it doesn't consume it. if it is a bug can you please fix it? this is one of my favorite mod. If there's a crash with Tinkers' Construct, I'm not aware of it. You should report the crash on the issue tracker so I can fix it when I get the chance. Just wondering, but why the unlimited leveling? This means that with the right amount of fighting, these minions can get ridiculously OP. I think there should at least be some sort of damage cap, so they don't start dealing ridiculous amounts of damage and one-shot everything. While it's theoretically possible to get to an OP amount of damage, the requirements to level up increase exponentially, so it's pretty difficult to get to that point.